In addition to two Janesville golf courses, you can enjoy a day on the greens at twelve Rock County golf courses. Click here for a printable list of more than 20 golf courses within a 45 minute drive of Janesville. 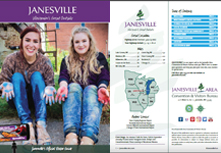 Check out downtown Janesville for options closer to the heart of Janesville.